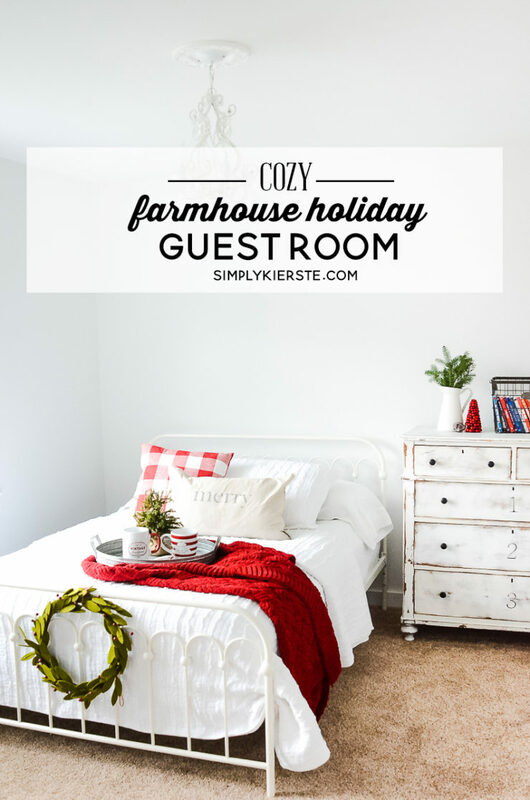 The holiday season means spending time with family and friends, and I decided it was the perfect time to add extra comfort, coziness, and a little Christmas charm to our farmhouse holiday guest room! I’m so happy with this cozy bedroom space, and can’t wait to have guests! 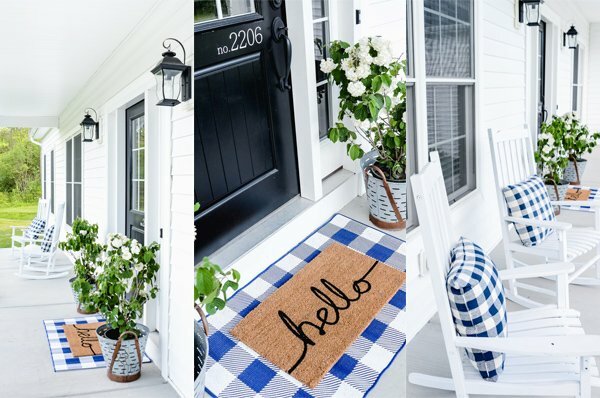 Thank you so Better Homes and Gardens at Walmart sponsoring this post, and for their amazing products. All opinions about their products are 100% mine. Affiliate links are included below, which help support this blog. My number one goal was adding comfort–and I started from the bottom up, with new sheets, pillows, and the most awesome mattress pad EVER. I’m serious. I fell in love with the Snap ‘n Wash mattress pad by Better Homes and Gardens at Walmart back in July when I visited the Better Homes and Gardens headquarters, and I knew then and there I needed to have it. Why do I love it so much? The top part snaps off and on, making it so quick and easy to remove it for washing, and then putting it back on again. That’s worth a lot in my world, with a bunch of littles and lots of sheet changing. I really needed new sheets and pillows too, and I went with the classic white that I love so much. After I finished putting everything on, I was really tempted to just lay down and take a nap! Once the bed was made, I started adding simple decor to make it feel like Christmas. Red is my favorite color, so I love this time of year because it gives me an extra reason to add even more of it around my house, and that included the guest room. I added a red throw, green wreath with red berries, a red gingham pillow (could you just die over that pillow? I’m kind of obsessed! ), a “merry” pillow, and a metal tray with the cutest red and white mugs I’ve ever seen. And I could not love this cute white metal bed any more than I do, or the white ruffled bedding…they’re both from Walmart too! And last but not least, fluffy guest towels are perfect in tucked in this super cute hyacinth basket with a chalkboard label. I really love baskets–I feel like I can’t ever have enough! We’re now open for Christmas guests! You can see the rest of my Christmas Home Tour HERE! Your guest bedroom looks so nice and inviting! I like the entire look. I was wondering where I could find your wreath! You are so clever. Love your whole house. Stinking adorable!!!! 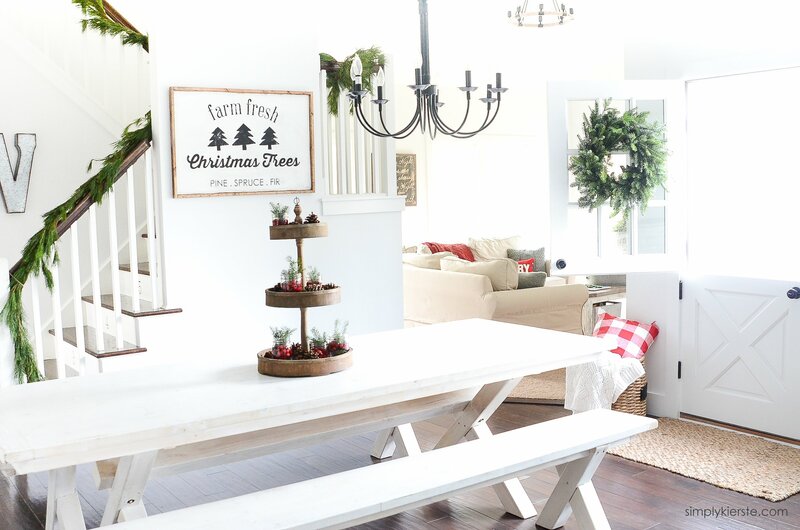 Love the red & white & all the super-cute touches. What a beautiful room. Your guests won’t want to ever leave. Looks like a million bucks–amazing that you did it for so little money. Absolutely adorable!! I love the bed and dresser. Love the wreath on the footboard. Super adorable!! cute, looks like a great room you can adjust with seasons easily. how did you make the felt wreath?